LAWRENCE — Matthew Van Dyke was letting his dogs out late Thursday afternoon when he heard a loud boom. Then he saw at least four people, whom he believed to be teenagers, rush out of a single-family home on Chickering Road. One of them was limping. 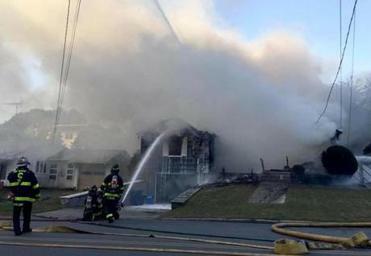 In just seconds, the home collapsed, after a disastrous natural gas explosion caused dozens of fires across Lawrence, Andover, and North Andover. As many as 70 properties were damaged or destroyed as fires rocked the Merrimack Valley communities. The sides of the Chickering Road home were ripped open, and the roof was tilted at an odd angle. Debris littered the road and front yard. 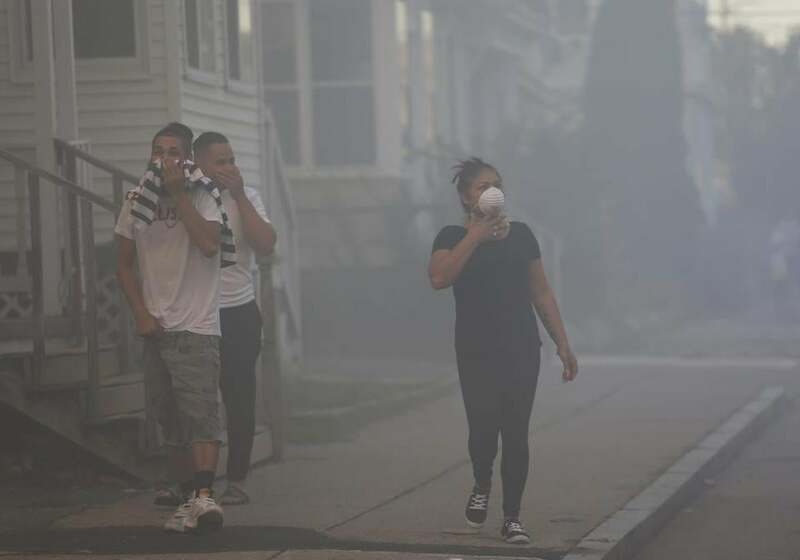 The South Lawrence neighborhood smelled of smoke, and news helicopters whirred overhead as police turned residents away from the street Thursday evening. “It’s insane,” Van Dyke said. That sentiment was shared by residents across the Merrimack Valley, where entire neighborhoods were forced to evacuate as fire crews scrambled to fight the fires and turn off gas and electrical lines in the three municipalities. “It was like a movie,” said Manuel Cabrera, who was on his lunch break a little after 4:15 p.m. at a Taco Bell near Winthrop Avenue in Lawrence when he felt the ground rumble. “I’ve never felt anything like it,” he said. Immediately afterward, he saw fire erupt behind him, near Chickering Road, while smoke filled the area around Springfield Street, he said. He tried to leave the area and return to his job, across the street at Plaza 114, but by that time the whole shopping center was engulfed in smoke. “That’s when I got an alert about the explosion and heard sirens,” he said. Cabrera got the rest of the day off from work but ended up at Parthum Elementary School, where there were many residents who had been evacuated. Mark Chisholm was returning to his downtown Andover home from work when his teenage children told him the youth center had been closed because of a gas leak. Around 3:30 p.m., he got an emergency alert from the town, urging him to evacuate and to shut off the gas to his house. Chisholm tried to close the rusted main outside of his house with a small wrench, without success. He then found a monkey wrench, and succeeded. Now armed with the right tool for the job, he and some other men in the neighborhood who had monkey wrenches of their own rushed to help their neighbors. One of his 14-year-old twin sons, Jacob, saw his father and the other men running from house to house. “Hey, Dad, there are all these middle-aged guys running around saving the day with monkey wrenches,’’ Jacob Chisholm said, according to his father. “We are going to save the world,“ Chisholm replied. He said he shut off the power to three homes, got in his car with his three children, and drove to his mother-in-law’s house in another part of Andover to shut off the gas there and spend the evening with her. Traffic was gridlocked, he said, and he saw a “father and son scratching their heads” trying to figure out how to shut off their gas. Chisholm pulled over and used his monkey wrench to close gas mains at two homes, he said. “Once you do it, you are an expert,’’ he added. Meanwhile, his children were getting reports from friends via texts about evacuating, smelling gas, and seeing smoke from fires across town. As dusk fell, residents were gathering at North Andover High School. Some called their families. Others calmed children. Just about everyone was exchanging information:How many fires and where? Have you heard anything? In Lawrence at about 5:15 p.m., Myra Ortiz was driving with her son to Lawrence High School for a financial aid night when sirens whizzed by. At the school, the principal turned them away, saying that a gas leak had caused an explosion in the area. Ortiz’s mind immediately went to her 15-year-old daughter at home. “Up until a few minutes before, my biggest concern was that I left my daughter at home with a chicken on the grill,” Ortiz said.